Throughout the year 2005, my good friend and then-X PRIZE-employee Brooke Owens led a large team of interns in a project to build full scale replicas of SpaceShipOne. The Foundation hired a Technical Lead, Christopher Hackman, a local airplane builder, to help guide the process. Working across the street from Scaled Composites, the team interfaced with Scaled's engineers and designers, and often using the original tooling used to manufacture the historic Ansari X PRIZE winner, they constructed the parts for six different copies of the vehicle on a scale of one to one. They did this work pro bono, for the most part, because they thought it was fun, thought they'd get some good job experience, and believed that the replicas could be put to good use inspiring people and teaching about a historic moment. At the end of the project, the crew had fabricated wings, horizontal stabilizers, booms, and various other parts needed to make the six replicas. These parts were then passed off to an outside contractor for final assembly. 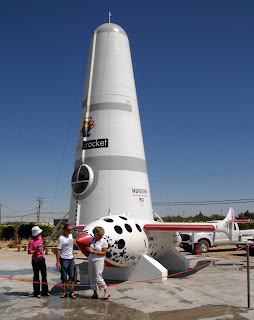 Since then, many of the replicas have been installed in exciting places like the St. Louis Science Center, Google Headquarters (as seen here), the Bakersfield Airport Terminal; and the New Mexico Museum of Space History. Others have made appearances at special events, such as the X PRIZE Cups or Virgin Galactic's unveiling of the SpaceShipTwo interior at Wired NextFest in 2006 (the same event where, one year later, we'd announce the Google Lunar X PRIZE. Last week, another one of the full scale replicas found a home--and it's a great one. Just in time for special ceremony to memorialize the three Scaled Composites team members who were lost in a fatal accident one year ago, a SpaceShipOne replica from this project was placed in the new Legacy Park at the Mojave Air and Space Port. And the X PRIZE team is happy to see her there. Now is also a great time to say "Thank You!" once more to those who helped complete this project. Special thanks to: Ernesto Acosta, Oliver Arend, Jeffrey Beach, Mike Conti, Mark Copley, Francois Duvall, Fernando Miguel Fernandez, Dayne Godwin, Kirk Kittell, Dana Klein, Michael McGuire, Jonathan Pickrel, Ryan Porcia, Grant Stead, Scott Tagge, Mike Turner, Brian Woodard. Thanks as well to Mike Kelly; to our contractor, WonderWorks; and to many others who offered bursts of volunteer manpower to allow us to get the job done--thanks to all them, too! Lastly, thanks to Bill Deaver of Mojave Desert News for these photographs! I'd like to ask something I always wondered since the SpaceShipOne flights, but was never able to answer. 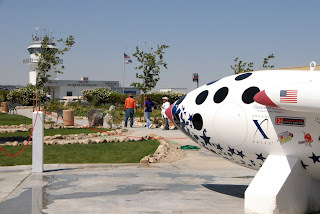 Back then, the X PRIZE Foundation web site stated that a list of all members would have flown aboard the winning X PRIZE vehicle, which turned out to be SpaceShipOne. I was one such member. Although the Foundation did send me a certificate via email at the time, I was never able to know in which material form the member list was stored on the vehicle. Was it a handwritten/printed document? Some sort of magnetic storage medium? Or maybe something different? I contacted the X PRIZE foundation via email, but got no feedback. I also posted queries to online space discussion forums and mailing lists, but without success. Paolo -- Great question! I was just a volunteer at XPF at the time, so I don't know the answer off hand, but let me see if I can track it down for you. "The names flew on a CD ROM that was carried in one of the 'back seat ballast packs' that sat on the back seats in SpaceShipOne. ... I personally delivered the materials to Burt's folks and received them back after the flights." It does help, thanks for the info.